Women carry emergency food supplies from a World Food Programme (WFP) helicopter that landed in Thanyang, South Sudan. With famine looming in four countries, the United Nations-backed Committee on World Food Security (CFS) stressed today the need to rally support for both immediate relief to people at risk and for longer-term initiatives. “Governments, civic groups and businesses need to rally support for both immediate relief to people in countries at risk of famine and longer-term initiatives that will allow them to recover and restore their livelihoods,” Ambassador Amira Gornass, Chair of the CFS, said today in Rome. Famine has been declared in some counties of South Sudan, and the number of people close to sliding from emergency to disaster is perilously high in north-eastern Nigeria, Somalia and Yemen, according to the Food and Agricultural Organization (FAO) and other UN agencies. The risk of famine in all four countries – where some 30 million people are uncertain as to where their next meal will come from or rely on humanitarian assistance – is mostly induced by conflict, which has disrupted food production, blocked aid and commodities from accessing vulnerable communities and driven food prices beyond what people can afford. “I urge you to take action now to relieve the impending suffering and to prevent further damage to livelihoods,” Ms. Gornass stated in a letter to CFS Members and stakeholders, as well as the international community at large, to step-up their response to the crises in the four countries. “Everyone should do what they can to support the IASC and to mobilize the necessary resources to enable emergency and relief activities to continue,” she added. While emergency relief is an immediate priority, plans for medium and longer-term assistance to support recovery and prevent future famines must be supported, the CFS Chair emphasized. “The affected populations of these four countries need our help now. We, as the international community, need to act urgently and come together with effective actions,” she said. In 2015 CFS approved the Framework for Action for Food Security and Nutrition in Protracted Crises that sets out concrete policy approaches that can build resilience. All stakeholders, public and private, should apply the principles and actions laid out in that document in the four countries and wherever there is a protracted crisis that threatens food security and nutrition. “I am counting on you to respond in a way that will ensure that short-term relief is properly funded while medium and long-term measures are taken to build resilience and to eradicate hunger and malnutrition for good,” concluded Ambassador Gornass. The Committee on World Food Security (CFS) is the foremost inclusive international and intergovernmental platform for all stakeholders to work together to ensure food security and nutrition for all. 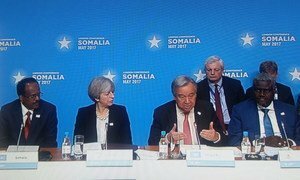 Opening a major conference on Somalia, United Nations Secretary-General António Guterres today urged the international community to support security efforts in the country battling Al-Shabaab and aid the more than six million Somalis affected by the violence and a deadly drought.